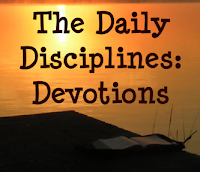 The first daily discipline we want to discuss is that of devotions. Only by seeking God and growing in Him can we hope to be disciplined in other areas of life, for it is only in His strength that we can do things that are worthwhile. Often, if I neglect or forget to have devotions, I find the whole day going wrong. I feel stressed, things don't work out right, and I don't have a restful or peaceful outlook on life. When I realize what I left out of my day, and sit down to spend time with God and in His Word, my soul is calmed; I continue the day, maybe not completely stress-free, but with a better outlook on life, as I've turned my heart and mind to Christ. This isn't to say that devotions are somehow a magic cure-all, but that by including them in your routine, you will be amazed at what a wonderful difference they make. I am blessed to have parents who instilled in me the discipline of daily devotions. Even before we could read, Mom would read us Bible stories and sing songs with us, and we'd always sit in on family devotions. As soon as we could read, we were taught to spend at least a little time reading the Bible in the morning. In fact, we were told not to read any other books until after we'd read the Bible - a big motivation for this voracious reader! In addition to personal devotions, we were taught to contribute to family devotions by reading the assigned chapter and answering whatever question format we were following at the time. When very young, we only had to answer maybe one or two of the questions, but as soon we were expected to grow capable of more. We all know that having daily devotions is a good thing. So, how and where do we start? At New Attitude, they told everyone a great way to be consistent in devotions every day: Find a time, a place and a plan. It may be different for every person, but by finding something that works for you and disciplining yourself to do it every day, you will build a habit that's hard to break. To help in discussion, I'd like each of you to share your time, place, and plan. Everyone is different, so one person's plan won't always work for the next person. However, by sharing your plans, someone may get ideas that will hep them develop their own. My time for devotions is right after I get up, which I aim to be 6 a.m. Like everything else, it doesn't always happen, but I try to be consistent with it. I find that by starting my day in God's Word, I am much better prepared to face the challenges and opportunities of the day ahead. By beginning with God, my focus is placed on Him. It's not to say that having devotions in the afternoon or evening is bad (everyone's schedules are different!) but, for me, I find that mornings are best. And, by doing devotions first thing, I am more likely to do them. If I put them off, it's a lot easier to forget them or let the busyness of the day crowd it out. As far as the length of my devotions, it really depends on what I read that day, if I need to be somewhere at a certain time, or just however long I feel like I need. It's on average 30 minutes to an hour. Early mornings, however, can sometimes be hard. sometimes I am so tired or drowsy that it's hard to stay awake, much less focus on learning something from God's Word! Sometimes getting dressed first helps. But usually, a lot of it depends on the place. During the colder months, I would often have a hard time keeping my eyes open and applying my mind to what I was reading. A lot of it was a result of where I was having devotions: in my bed, propped up with pillows, under a pile of blankets. I did it because I was cold! We heat with wood, and it was very chilly in the house before the fires were started. But, if I made myself get out of my soft warm bed and sit in a chair (still wrapped in a blanket so that I wouldn't freeze to death!) I was able to have a much more focused quiet time. It's easier now that it's wam, but I still find that if I stay in my nice cozy bed, I get quite drowsy. So, I try to make the place of my devotions a chair in my room or the swing outside. This year, in all my reading, I'm trying to write down each verse I find about purity, waiting, and trust, organized in a special notebook. I also have a prayer journal, and try to find a verse or two from my reading to really meditate on and pray through. I've found that writing prayers helps keep my mind more focused, though I try to spend some time in concentrated silent or out-loud praying. I also find that writing down Scripture helps me remember and learn more. Then there's preparing for family devotions, which we try to have each week day. Currently we're reading through Isaiah, each of us writing down then sharing what we learn about God from that chapter. Most of my reading is from the Bible, as I like to learn things straight from the source. However, devotional books can be good as well, and I currently read a page in His Princess at the beginning of my devotions, and pray through a prayer in The Valley of Vision at the end. So, what is your time, place, and plan? Please share it with us! It may be elaborate or simple, depending on which season of life you're in. It's just important that you make sure you spend some time having personal devotions each day. It will greatly help your outlook on life and give you tools and the strength you need to do other daily disciplines with the Lord's help. Also, if you'd like, share what you're currently reading in God's Word right now, and what you are learning from it! Good post! I personally do my Bible reading in evening/late at night. (I'm a nightowl!) I just started this actually, so I thought what better place to start than the BEGINNING of life itself and read on from there? So, I read a chapter of Genesis each night, or try to, while taking notes. As I get more into this 'discipline', I will probably read more, but this is new with me so it's just a start! I have tried to post comments before but they never work; perhaps this one will! I arise at 6 (5:45 in the school year) and kneel at my bed to pray. My prayers usually are 15-30 minutes. After this I read the Bible (in my bedroom, usually sitting on my bed.) Currently I am reading through rather slowly, taking detailed notes as I go, thus I only get through about a chapter a day. If I have time, I then read from a book such as Raising Maidens of Virtue or Charles H. Spurgeon's Morning and Evening. In the evenings I normally read a Psalm and a few New Testament verses to meditate on as I fall asleep. Thank you for this post! I visit your blog often and I'm always encouraged by it. usual time: Aim: 7am (not gonna happen yet again because I'm going to bed late as I try to get websites back up), so it's more like ~5:30pm. plan: 2 Chapters as per: For the Love of God + Some in Matthew as per TableTalk + 1 page in Valley of Vision + 1 memo of prayer items in PDA (currently at 2). Thanks Anna, that is quite thoruough. :) I would like to point out that while it is very important to have a set time(or two) for devotions, we must be very careful to avoid routine, because that is the enemy. In other words, do things differently, add variety. Stay focused on the Lord and don't get distracted with little habits. Thanks for sharing all of your plans! It's fun to see how different each person is. Samantha: Great job beginning this discipline! It will certainly help you grow in the Lord. Taking notes while reading certainly helps things sink it! Tiffany: Thanks for commenting! I don't know why it didn't work for you at home. Your disciplines sound great! Elijah: Thanks again for the book For the of God! I'll probably do it next year when I'm done with my current plan. Maria Pauline: Thanks for the long comment! You're right - getting too much into routine can be bad, and I've struggled with that before. However, sometimes routine helps, so it's hard balance to find. My plan is rather routine, but I read different things each day, so it doesn't get boring (as long as I read and study with the intention of learning and growing closer to God). I find it wonderfully amazing how I can read the same thing so many times, and new things will pop out at me each time! I'm currently working on a 90-day reading plan. It started with Genesis, Job, and and Matthew and progresses in order from those three books. I generally do my reading after breakfast and before I leave for work, although some days I oversleep and end up catching up later. Once I finish the 90 day reading (I'm about halfway through) I'll probably switch over to a one year plan for the future. Ellen: I've seen a lot of people doing the 90-day plan! It sounds really good, to be flooded with that much Scripture! I pray the rosary each morning. I also pray the Divine Offices (hours) which are morning, noon, vespers, and compline. To me, it's good to know that there are Christians reading and praying the same thing with me all throughout the day. Thanks a for this blog! It's very helpful to me. I haven't ever routinely kept a journal for a long time nor written down my prayers often. Although I do take thorough notes on my Bible readings, but I don't "journal" my prayer life. I'd like to do that from now on! I too prefer doing my devotions in the morning. I find that days go by better when I do, and the things I learn/read stick with me during the day. I find that I am a more pleasant, nicer, more loving person when I stick to doing devotions in the morning. It reinforces Christlike attitudes in me :).